The best time to experiment with your twins’ tastes and solid food is when they can sit on their own. Investing in the best highchairs for twins guarantees that the experience is safe and enjoyable for them. And depending on the type of highchair you get, you can use it for the upcoming years to come. That’s why today, we’re looking into things you should consider when buying highchairs for your twin babies. Highchairs are pieces of furniture that are used by babies and toddlers. They are seated and strapped on the chair with a fixed tray in front of them. Normally, older babies have to be spoon-fed but as they grow older, you can place their food on the tray so they can learn how to feed themselves. These days, highchairs are also used so your baby can take a seat with you at the table. You won’t have troubles keeping them away from your plate and getting your hands full. However, you’ll be able to keep them safely near you. Babies tend to start learning how to sit on their own by six months. They’d start eating solids between 4 to 6 months. That being said, highchairs are not really a priority unless that time comes. But it’s better than you already start looking for possible highchairs for twins. You’d have to consider a few factors so it may take a while. Highchairs are for twins who are at least 6 months old up until 3 years old or until they reach the maximum weight limit. If you have an older child or your babies are newborns, you might want to pass on it and wait until it’s the proper time to buy one. That being said, here are a few things to consider when you’re buying highchairs for twins. Safety features should be the main factor you should consider. There should be a harness or a buckle or even leg straps -- anything that will keep them from falling face first or something that can keep them stable and in place. There should also be a crotch post to stop them from sliding down the seat. There are some highchairs that have wheels and if you want something that can move, make sure that the wheels can be locked. However, it’s best if you choose a type without one, especially when you have hyperactive twins. Some chairs are foldable and when you buy one, make sure it doesn’t snap on your fingers or accidentally close when you’re trying to put on or take your child from the chair. Plus highchairs for twins that have a wider base often have better stability. Make sure that it doesn’t stumble or topple over when your babies are moving. Look for items that have a JPMA (Juvenile Products Manufacturing Association), ASTM (American Society for Testing and Materials), and/or CPSC (Consumer Products Safety Commission) logos. This will determine how long you’d be able to use the highchair. Most highchairs can be used until they are 2 or 3 years old or when they reach a maximum of 30 to 35 pounds. Buying something like this would be a good investment since you’ll be able to use it for a longer period of time. This is something you really should consider especially when you’re likely going to buy two highchairs for your twins. There are certain types of highchairs available today. Each one looks different and often has different strengths and disadvantages. Standard highchair - This is the most common type you’ll see complete with every necessary accessory such as safety features and a tray. European-style - This is often a tray-less highchair where you’ll have easier access to your child. You can pull them closer to your table so you can feed them. These can often accommodate toddlers and even beyond. Portable/hook-on - These are the types of highchairs for twins that are highly portable and can be used when traveling. You can hook them onto a table but make sure that your table is strong enough to hold its weight and the chair is able to withstand the weight of your twins. Booster seat - These are often for toddlers who can sit well on their own but has problems reaching the table. It also has some type of harness or security belt to keep them in place. If there’s one hard thing to consider, it’s pretty much choosing the design and style of the highchair. Each has its own distinct look and there are several others that have varying features which make the highchair more convenient and comfortable for your twins. However, these considerations are often subjective. You might find one highchair better than the other. But it’s always best when you can find a highchair that you believe will benefit you as well as your twins. Not everyone has enough space to put another piece of furniture, especially when you need two highchairs for twins. However, there are certain types that are foldable and smaller than usual. These can help save space whenever you’re using them or not. Then again, make sure that your foldable highchair is safe for you and your babies. If you have more space to spare, it’s still better to measure the available space and look at the dimensions of the chair so you won’t have troubles later on when you accidentally bought a bigger highchair than your space. Lastly, consider the cost. The difference between the price points of various highchairs for twins can be significant depending on the brand and features. Since you’ll be buying two highchairs for your babies, it might be best to find a price point that you’re comfortable with while making sure the features are exactly what you need. This Cosco highchair is a good choice for investment as your twins can use it until they have become toddlers or up until they have reached 50 pounds. Since it is foldable, it can save you some space especially since you’ll need a couple of these for each twin. It can be flattened when folded, making it easier to store when not in use. Plus it was made for traveling so it’s lightweight and portable. Most importantly, it has sturdy reinforced legs for stability and features a three-point harness to keep even active kids safe. It has been approved by both ASTM and JPMA. It features a full-size tray with a cup holder and can be adjusted to accommodate your growing child. Your children will feel comfortable on it with its durable but soft fabric as well as a built-in leg rest. There’s also no need to fuss over cleaning since you can wipe the fabric easily or you can remove it and have it machine washed. This Baby Trend highchair is suitable for older babies or toddlers who can sit on upright on their own. They can use it until they are 3-years old or until they reach 40 pounds, whichever comes first. It’s a booster type with a three-point safety harness that keeps your baby safe even if they move quite a long. Thanks to its compact steel frame, it’s durable and stable. However, it’s main selling point is its adjustments. There are three recline and six height adjustments available depending on your baby’s preference and age. You can also use it for higher tables and countertops with the highest height adjustment. As they grow, the tray can also accommodate their needs and can be adjusted to three height levels. It’s also easy to clean. You can remove the tray and put it on the dishwasher a quick clean. Plus you can easily wipe the chair to clean any excess food. The whole highchair can also be folded for ease of storage, space saving, and for portability. The JOOVY Nook highchair features a swing open tray that can be adjusted to four positions and help accommodate your children’s needs. This can be used by your twins from the moment they are able to sit on their own until they reach 3 years old or even beyond, as long as they are under 50 pounds. It’s a sturdy highchair with a five-point harness to guarantee they won’t fall even if they move a lot. This whole highchair is pretty much easy to use and convenient. The swing open tray makes it easier to put or take your baby and can be adjusted with only one hand and no need for any cumbersome systems or mechanisms. It can also be detached and you can simply put it on the dishwasher plus the leatherette seats can be wiped easily to remove any excess foods or drinks. If your family is into traveling or you don’t have much space, it can be folded for storage or space saving when not used. This Ingenuity highchair is a good example of value for money. It can be used in three different ways and can be a good investment as you can use it for a longer time as this highchair is good for older babies who can sit on their own up until they become toddlers of around 3 years old or until they reach the maximum weight of 50 pounds, whichever comes first. As a 3-in-1 highchair, it acts as a full highchair for feeding, complete with a dishwasher-safe tray. It can also be removed from its steel legs and can be propped on a chair as a booster seat. Lastly, it can turn into a simple toddler chair. It can seat two kids at once. Your twins are guaranteed safe with a 3-point and 5-point harness. You don’t have to worry about heavy cleaning since it’s rather easy to clean. Either wipe the entire seat with a clean cloth or take off the seat pad and have it machine-washed. The best highchairs for twins are really just two things: able to keep them safe while feeding and able to keep up with their growth. 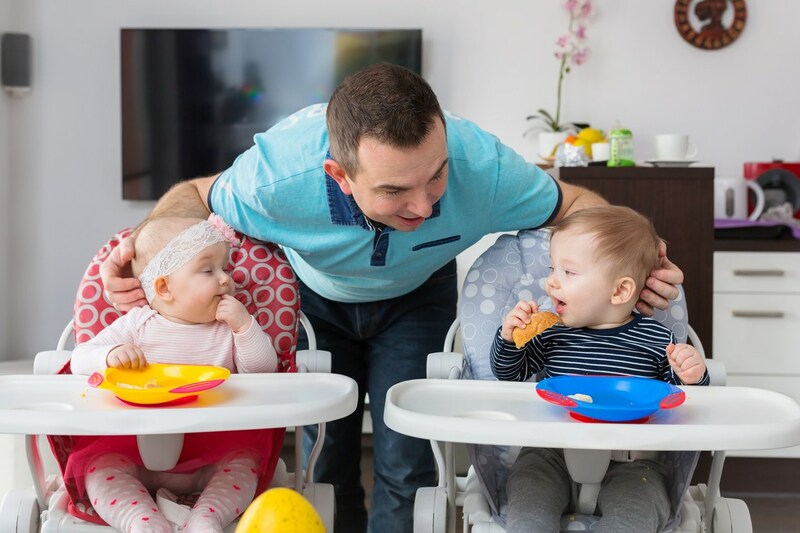 The highchairs you choose for your twins can enhance their feeding experience, especially when they are just learning to experiment with their food. Plus, it also helps make your job a little easier.